In order to provide our clients with a full service, Bearnes Hampton & Littlewood are Registered Firearms Dealers. Several members of staff hold their own shotgun licence and are available for advice on dealing with estate guns, valuations and selling at auction. 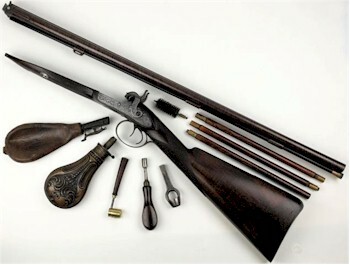 A cased, 20-bore double-barreled sporting gun made byRoss of Edinburgh. The finest of shotguns are those produced by the well known makers Purdy and Holland & Holland. However, there is a strong market at auction for many of the shotguns produced by the 19th century Birmingham and London Makers. Side-by-side sporting guns by Westly Richards, Greener, Davis and Army & Navy are to be found at auction form £200-£300 upwards. At present, a shot gun licence is not required for flintlock and percussion cap sporting guns. Should vendors or purchasers be in any doubts surrounding the legislation regarding sporting guns and firearms, please contact the department.